Wall Mount Racks typically come in Open Frame or Cabinet styles. The Open Frame, Wall Mount Rack is an effective, less expensive, racking option, but it won”t necessarily keep your equipment secure. To discourage equipment tampering, add panels to the top, bottom and sides, as well as a front cover. 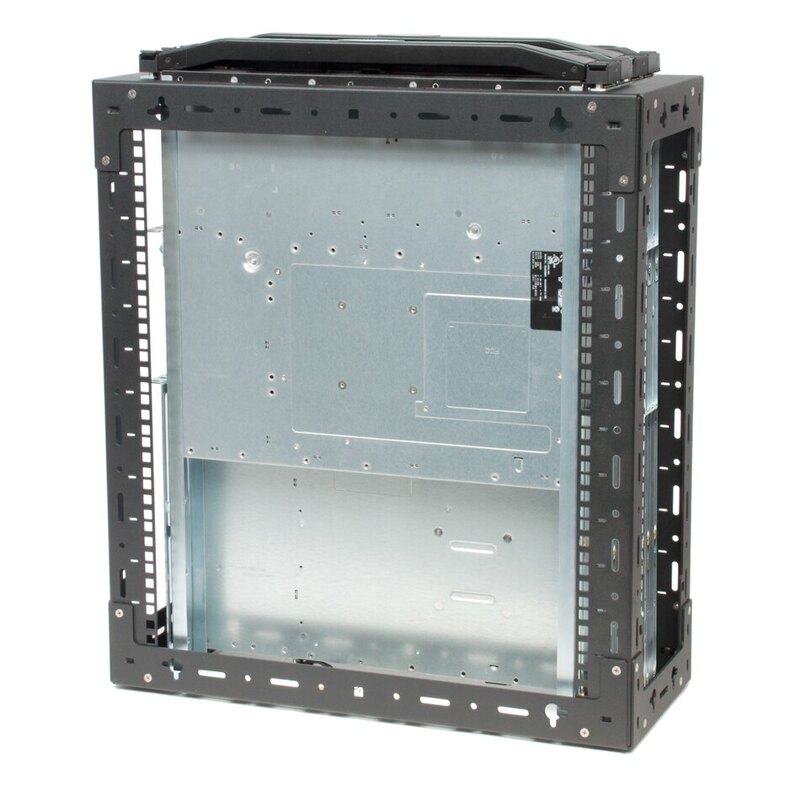 Because it”s an “Open Frame” rack, equipment installation, wiring and cable management tend to be easier than with an enclosed cabinet, and air flow is not an issue. Wall Mount Racks are available in many sizes for use with several applications. Open Frame, Wall Mount Racks are configured by height and depth selections. Heights may range from 12U to 21U, for example. When selecting the height, you determine how much rack U space you need. A “U space” measures 1.75″. A Wall Mount Rack may let you mount up to 21U (36.75″) of equipment in the front rack space, for example. If you don”t require that much U space, you might consider a 15U or 12U height instead. The depth of the Wall Mount Rack is measured in inches (or mm) since it”s important to know how much room is required to mount a piece of equipment in the rack. Before choosing a Wall Mount Rack depth, measure the depth of your equipment to make sure it will fit in the rack, and be sure to allow for a minimum of 3 inches in the back for cabling. Therefore, if you select a rack that is 10.5″ deep, your equipment should ideally be no more than 7.5″ deep. Also, consider whether you anticipate adding equipment in the future. The size of the equipment you plan to add later, may help determine the size of the rack you need. 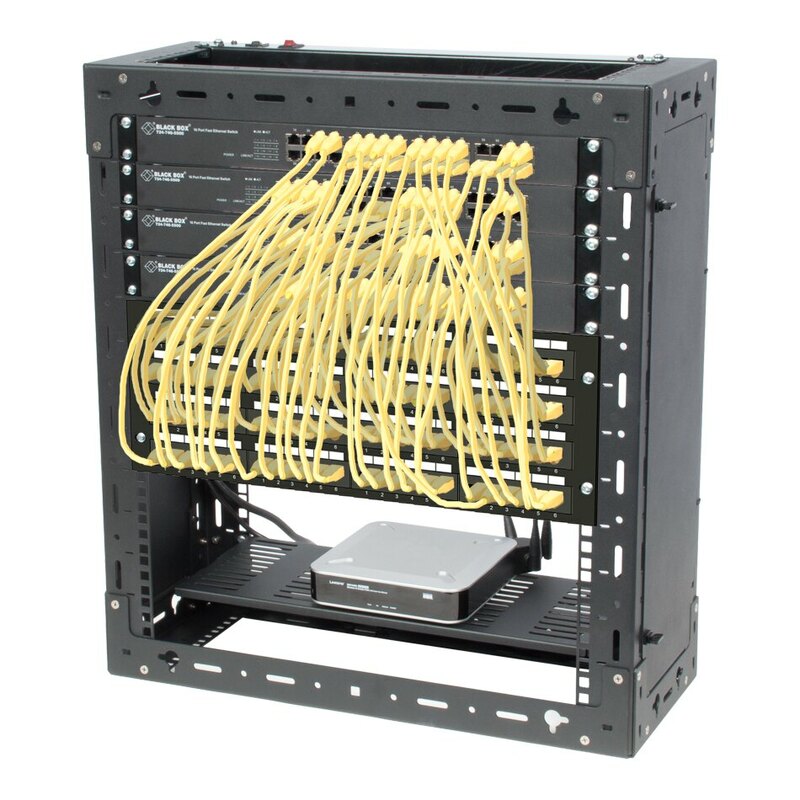 Note: The Wall Mount Rack shown below has additional U space on the top and bottom that may be used for equipment such as patch panels or power strips. The best thing about the Wall Mount Rack is that it can be mounted on a wall (or almost any flat surface), which means it takes up less space and stays out of your way. Depending on the size you select, a Wall Mount Rack may support 300 – 400 lbs of equipment. I recommend you review the installation instructions prior to purchasing a Wall Mount Rack to make sure they correspond to your preferred mounting configuration and location. Typically, the Wall Mount Rack will come with assembly, mounting and rack mount hardware, but I suggest you review the product documentation to be certain. What kind of equipment can I put in a Wall Mount Rack? Wall Mount Racks are primarily used for racking network equipment such as switches or patch panels, but servers may also be mounted vertically in a Wall Mount Rack. Notice in the photo below how the power strip is mounted on the top of the rack. This 12U x 4U Wall Rack has four, 1U servers mounted vertically. Tool-less Filler Panels may be used to enclose the open spaces in the Wall Mount Rack. In the photos below, a 3U filler panel was added to mostly enclose the 4U top of the rack, but 1U of space was intentionally left open. See Open Frame, Wall Mount Racks for sale online. This entry was posted on Wednesday, January 26th, 2011 at 1:11 pm	and is filed under Popular, Racks, Wall Mount Racks. You can follow any responses to this entry through the RSS 2.0 feed. You can leave a response, or trackback from your own site. Would you mind letting us know what operating system you are using and what version of Chrome you have installed? Thanks.